“Let’s Talk” is a program that provides easy access to informal, confidential consultations with UCC counselors. Counselors hold drop-in hours at various sites across campus throughout the week. Speaking with a counselor at “Let’s Talk” can provide insight, solutions, and referrals to other campus resources. Appointments are first-come, first-served. Usually there is not much of a wait. The counselor will listen closely to your concerns and provide support, perspective, and suggestions for resources. 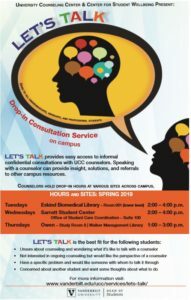 Let’s Talk is an outreach program that provides easy access to informal, confidential, and free consultations with clinicians (counselors) from the University Counseling Center (UCC). There is no appointment necessary and this is not to take place of traditional counseling. How is Let’s Talk different from the Counseling Service? Clinicians at the UCC provide ongoing individual or group therapy using a brief therapy model. 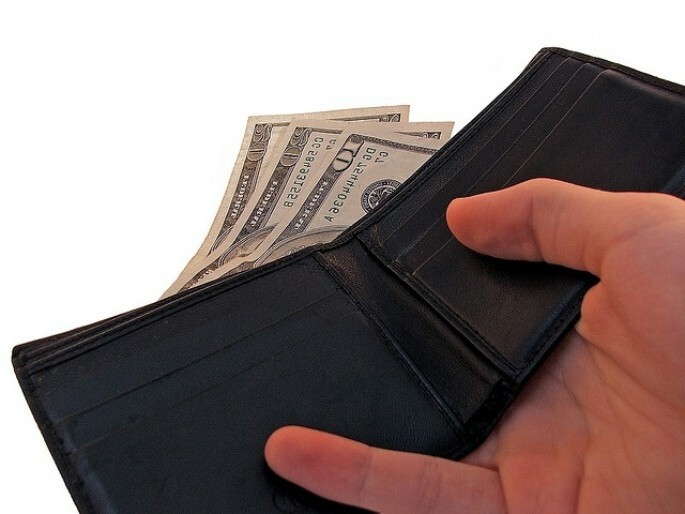 These meetings usually consist of weekly or bi-weekly 45-minute appointments. Let’s Talk is not formal therapy. It is a drop-in service where students can have brief informal consultation with a clinician from time to time. Who should use a Let’s Talk Consultation? What is the difference between Let’s Talk and emergency “Drop-In” services at UCC? Let’s Talk is an informal drop-in service to provide support at a satellite location. 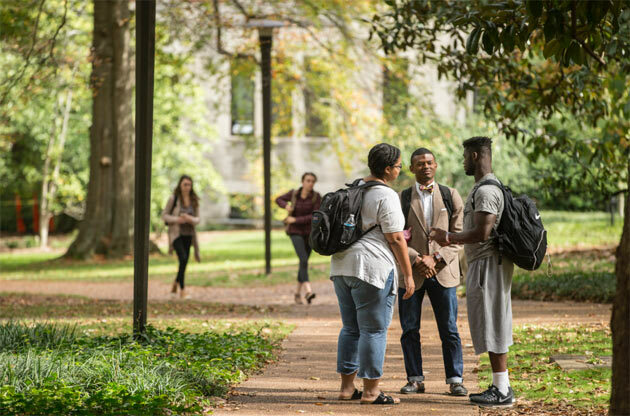 Emergency “drop-in” services, known as Crisis Care Counseling, take place on-site at the UCC and is a service for students in acute crisis who need immediate therapeutic support. For example, students who express serious concerns about their own safety or the safety of others, students with severe psychiatric symptoms, or students who have experienced recent trauma are more appropriately seen for emergency “drop-in” appointments. If a student presents to Let’s Talk in crisis, the counselor will assist the student in receiving the necessary services. This might include walking the student to the UCC or, if appropriate, to the Student Health Center to meet with an emergency “drop-in” clinician or accessing other emergency treatment. I think I have a problem that would benefit from counseling, but I don’t know anything about counseling. Would going to Let’s Talk help me figure out what to do? Absolutely. The counselor will talk through your issue with you and help you determine the best way to get help. Are Let’s Talk meetings confidential? Are there any limits to confidentiality? Conversations with Let’s Talk counselors are confidential. However, the primary exception is that counselors may need to share information in a situation in which safety for you or others is a concern. Let’s Talk counselors keep brief written notes of their contacts with students only in the event that there is an emergency, or when a student is referred to UCC for treatment. In these situations, other UCC clinicians may see these notes. Information is also collected about attendance, so that we can keep track of the students we are serving and those we need to continue serving. If you have further questions about confidentiality, we encourage you to discuss them with a Let’s Talk counselor and review the information given to you during your Let’s Talk session. Let’s Talk is not a substitute for psychotherapy or formal counseling and does not constitute mental health treatment. Let’s Talk counselors provide informal consultations to help students with specific problems and to introduce them to what it is like to speak with a counselor. 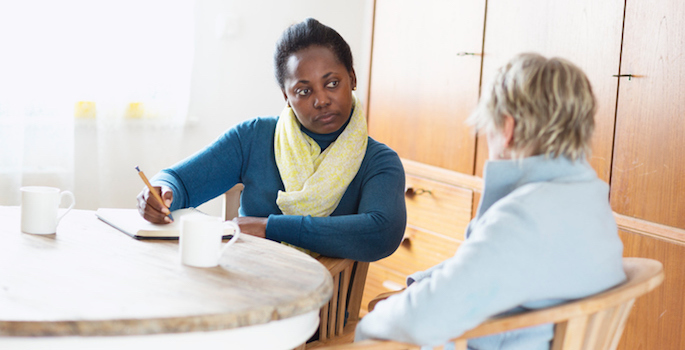 Your Let’s Talk counselor can help you determine whether formal therapy at the UCC would be useful to you and, if appropriate, assist you in scheduling an appointment. FAQ information was adapted with permission from Cornell University. Their dedicated efforts to provide innovative services to students and their willingness to share these resources with other colleges and universities are deeply appreciated.